The perfect place to keep treasured mementos close, this pretty diamond set heart locket will make a thoughtful and romantic gift for someone special. Crafted in 9ct rose gold for a feeling of warmth and luxury. 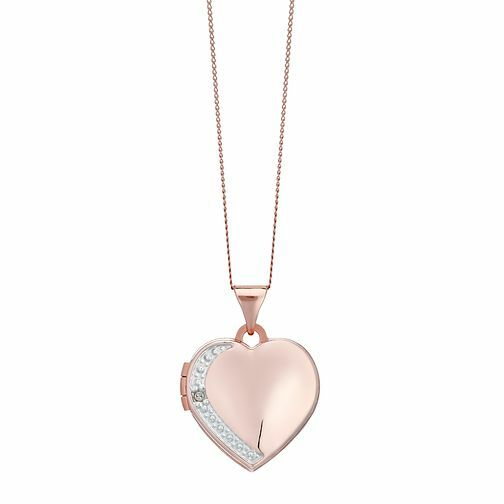 9ct Rose Gold Diamond Set Heart Locket is rated 3.0 out of 5 by 2. Rated 1 out of 5 by Anonymous from Disappointed with the quality of this necklace. Very disappointed in the quality of this product was purchased as a gift and thought the necklace and locket were not representative of the price paid. If I had seen this in person Instead if online I would not have purchased. An additional chain would require to be purchased to enable it to be worn.